A seriously cutting-edge mountaineering backpack. THE weapon of choice to go further, higher, higher still � and maybe even on a MILLET Expedition Project adventure! High in the mountains, every gram counts. 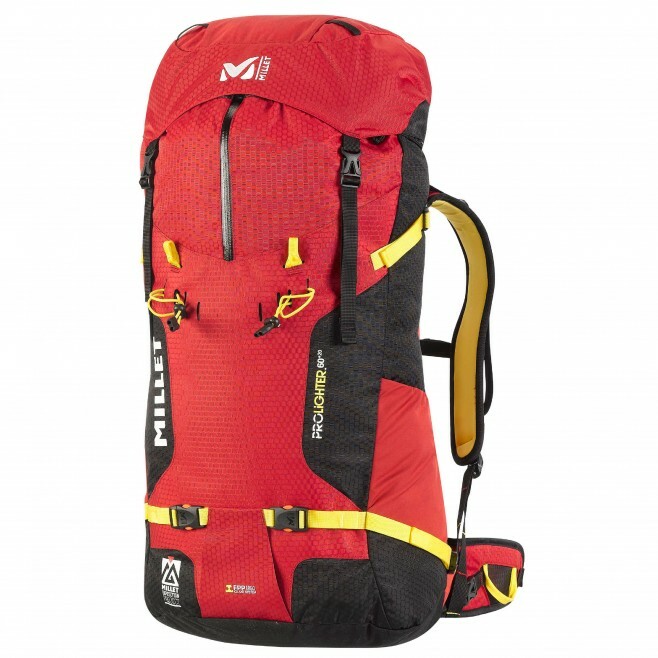 The PROLIGHTER MXP 60 is on a mission: to meet all the needs of committed alpinists, but with minimum weight. Developed with the Chamonix Guides Company, it must also be sturdy and reliable. So MILLET packed in all the essentials, but no frills. �We went for precision functions,� says Mich�le, product manager. �Ice-axe holder, rope holder, ski holder, bivy pad and storm collar are category must-haves. Large stretch side pockets combined with large carry straps manage part of your gear. Designed for committed mountaineering, this Prolighter has a clean-cut shape and ergonomic design for free-flowing movement.� The carry system is engineered for use with a harness and walking in deep snow, with its raised hip belt. In the high mountains, every gram counts, and every move counts. One central system lets you optimize adjustment. A zip opening on the top third of the pack provides good access to your kit, which will not fall out. Expedition shape. Two-buckle lid, extends with quick buckle for high capacity. Storm collar with access zip. Double compression strap.